Typically, you’ll build the base of your pool up to have a 2" pool bottom. 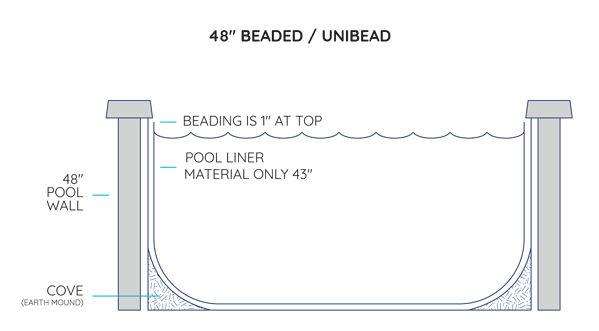 Pair this with the usual 6" from the top of the pool wall to the actual start of your waterline (since pools are not filled all the way to the top of the walls) and the water depth will end up being a total of 8" shallower than the wall height; so 40", 44", and 46" of water respectively. 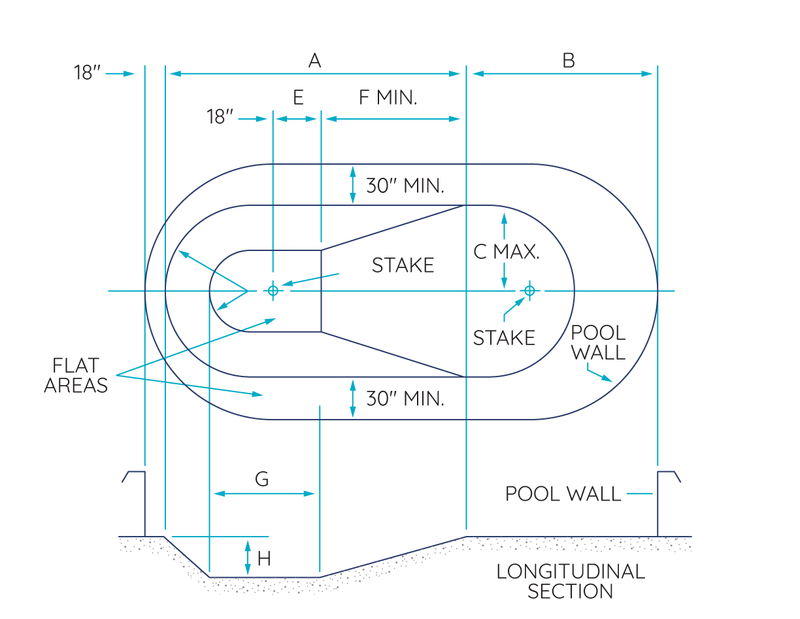 FUN FACT: The original purpose of taller pool walls was to provide additional privacy for the swimmers, i.e. 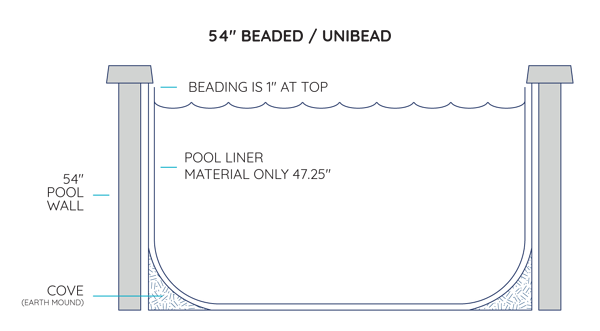 not necessarily for deeper water levels but for the wall to act more as a privacy fence. However, once available, swimmers decided that they preferred to have more space under the water instead and quickly started filling up their pools more. 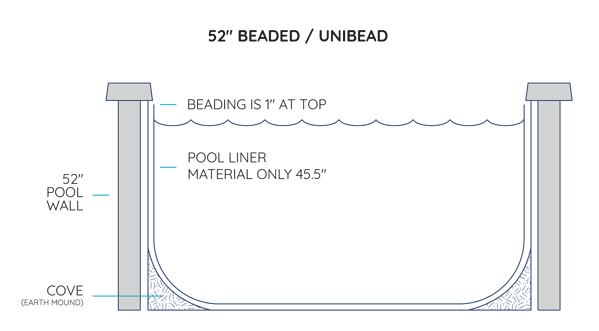 For this reason, all of the pools we offer have the skimmer cut out centered 6" or so below the top of the wall to allow for maximum water depth. You may slightly increase the water depth further by filling the pool a little higher than the fill line indicator on your skimmer; usually 1-3" more is a safe allowance. Keep in mind that there are some 52” & 54” pool walls out there with skimmer cut-outs at the same height as a 48” pool wall. This design makes the deeper water levels not efficiently achieved but are fair options if you prefer the older adage of having a layer of privacy that is your pool walls. 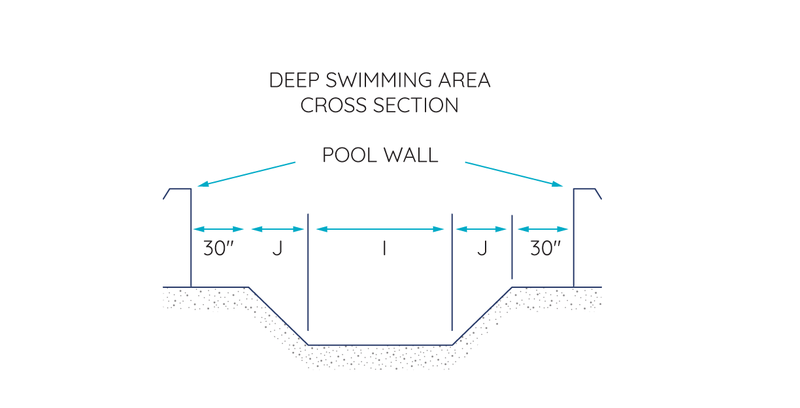 Older above ground pools are most commonly found in 48" pool wall heights and most of the 48" walls sold industry wide are meant to replace older pool walls. 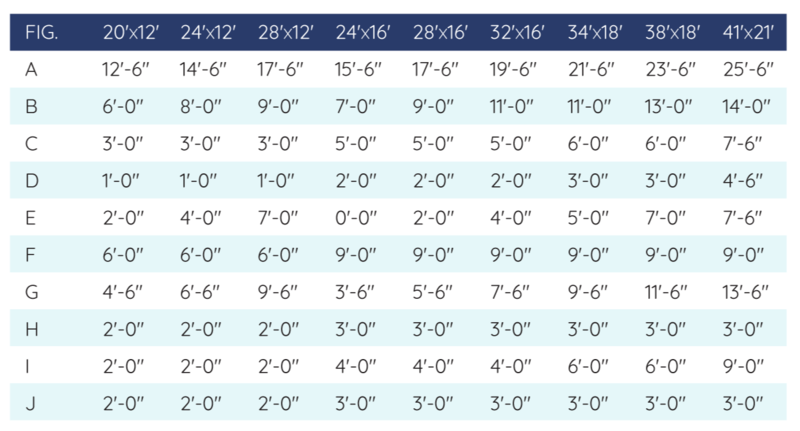 These days, the most common two heights sold are 52" & 54". Today, we don't necessarily recommend 54" over a 52" wall, simply because there’s not a lot of difference between them; literally 2" of water depth. 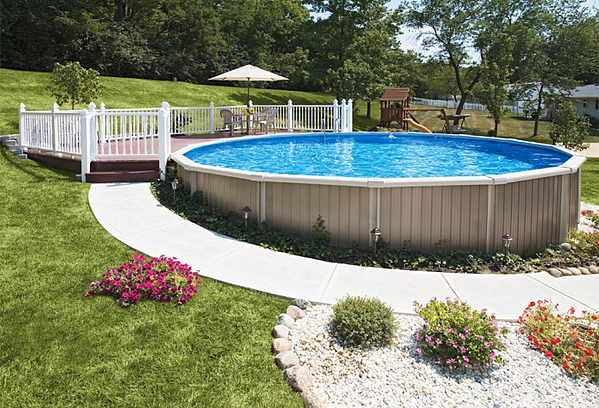 Instead, we recommend choosing which pool fits your budget in the colors or design that you prefer. If a standard flat bottom is comfortable for you and your family, there are many options of liners including overlap, j-hook, and beaded liners. (You can read more on those liner types here!) However, oftentimes customers are interested in learning about how to make above ground pools even deeper, and we have multiple solutions for that! 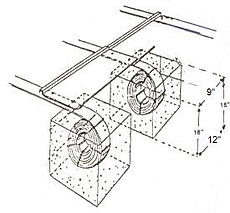 A standard overlap liner can accommodate a slightly deeper end. The overlapping material and the elasticity of the vinyl combine to safely increase the pools depth 5”-10” in a gradually sloped deeper area. Some customers also install these to make the entire pool a couple of inches deeper. While this option does not allow for a significantly deeper pool, it offers the widest variety of liner patterns and provides you with a true 4' of water depth. 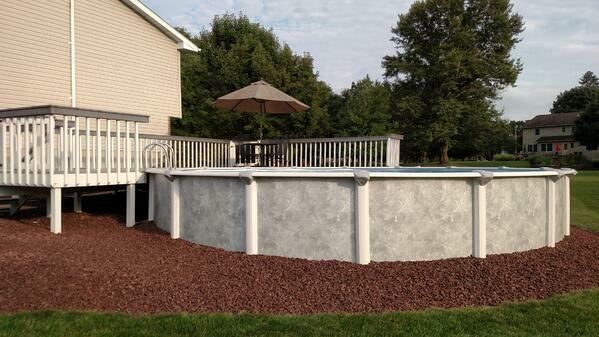 Older kids want a deeper pool to splash around in? 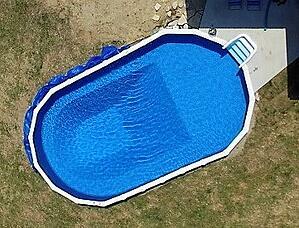 This will can be done with a 6' deep overlap style liner. This is a liner that has a long wall section that can extend into a deeper well. In the spirit of full disclosure, these liners do tend to produce wrinkles in the final installation. 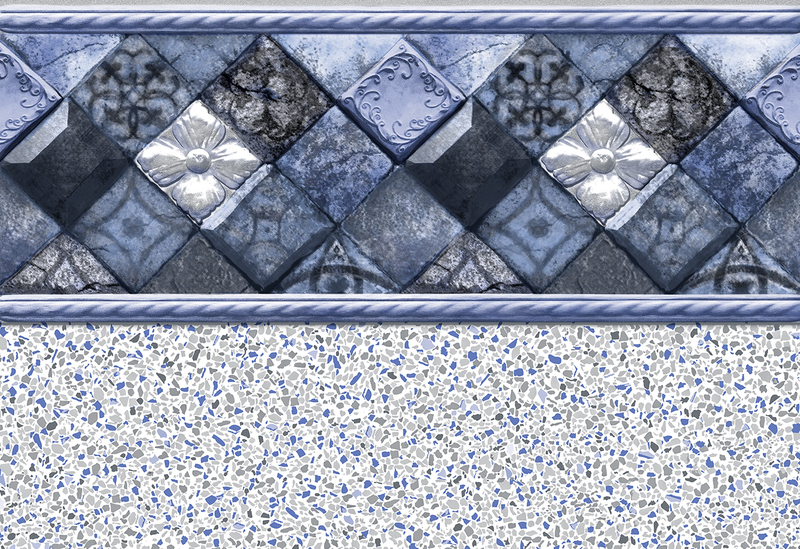 This is primarily an aesthetic issue. However, you do want to smooth them out as best as possible to prevent troubles when vacuuming the pool. 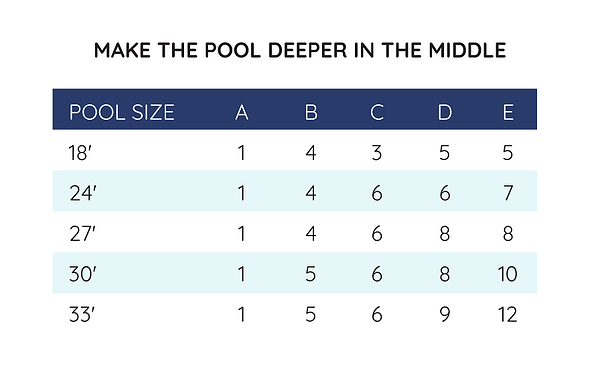 With pool sizes 15' round and larger- 6' overlap liners are offered as a selection in our pool kit builder, or as a replacement liner. They are available in both solid blue and full print! Want to practice snorkeling, or host more challenging retrieval games? Consider digging a deep end and pairing it with a suitable liner! An exciting option available for most sizes is the 7' expandable Lomart liners. These overlap liners are true expandable liners made with a higher ratio of plasticizers that will stretch into the deeper section, or hopper, that you have excavated. This offers the greatest amount of flexibility, as you can utilize this liner in variable depths and configurations. When installed properly you can produce a smooth floor to the pool with minimal wrinkling. When designing your dig, there are general best practices to follow. The front slope needs to be a minimum of 3' of slope for each 1' of drop, but can be greater. 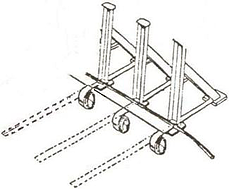 You will need enough flat area to accommodate your ladder or step. It is also important to remember to make sure that the ledge is wide enough for the supports for your pool. 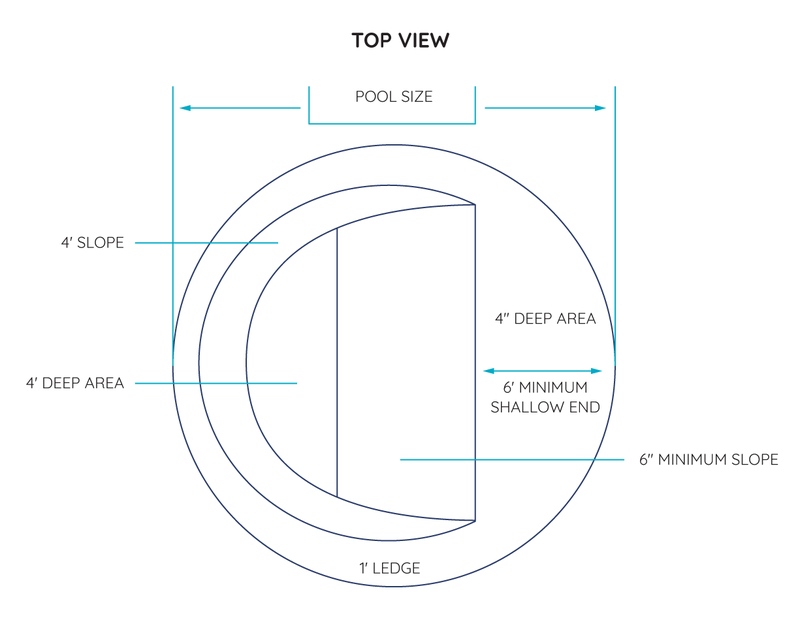 A round pool does make it easier to accommodate a deep end, because the structure of a circle does not require strap supports like most oval pool utilize. 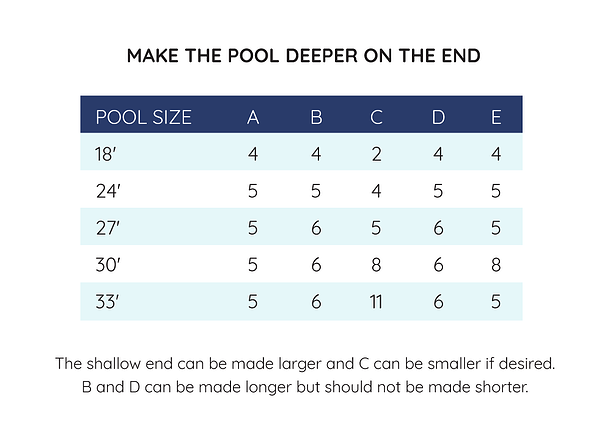 Oval pools with straps can be safely modified, to allow for a deep end, by not connecting the straps that you intend to make deeper and following these 4 steps. Use a post hole digger to dig a hole 18" - 20" deep hole directly in from of each side brace that will be on the deeper end of the pool. 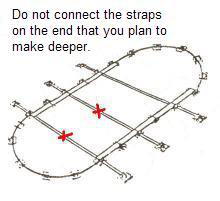 The hole should be wider as the hole gets deeper. Tightly coil the strap back to within 15" - 18" of the hold down plate. As you coil the straps, make sure that you do not allow space between the coils. 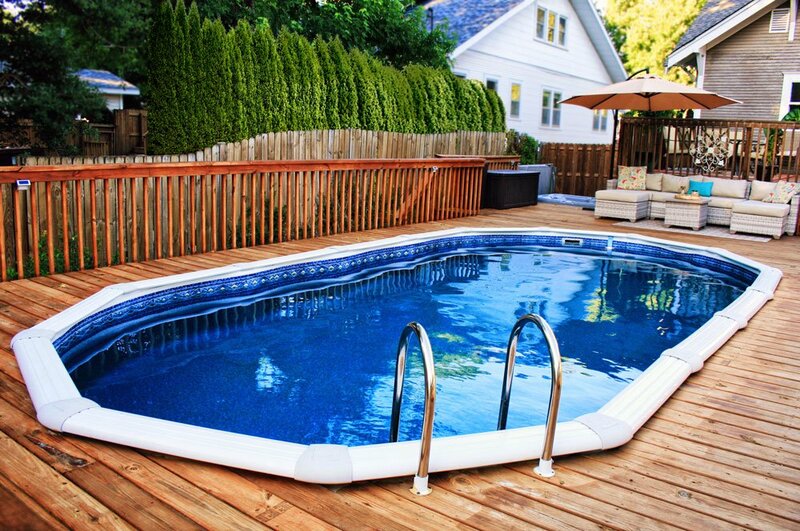 A tight coil will prevent the strap from tightening and the brace from leaning as the pool fills with water. 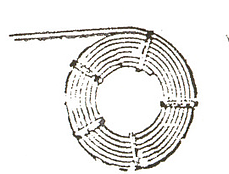 Tightly wrap wire around the coils to prevent the coil from springing loose. Put the coiled strap into the post hole. You can put all three straps on each side in the holes for a middle deeper pool or 2 straps on each side for a deeper on one end pool. Mix approximately one bag of concrete mix for each hole making sure that it is not a soupy mix. Use a stick or broom handle to pack the concrete into each hole to fill all voids. Check the side braces as you go to keep the top ledges straight. 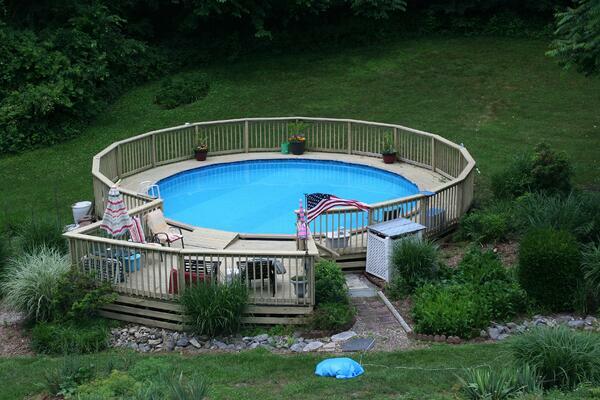 As you can see there are many options that will allow you to expand the possibilities for your above ground pool. These solutions are available with both new and existing pools. With a little additional ground prep and the appropriate liner, your family can still enjoy the backyard pool as they mature and grow! That being said, no matter how deep you make your above ground pool, under no circumstance should you ever dive into it. 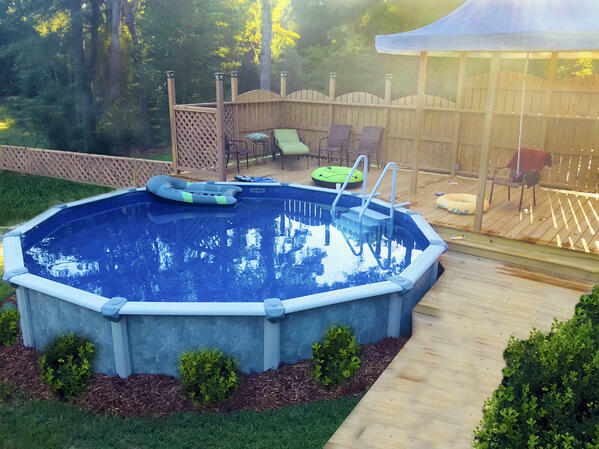 These pools will not meet regulations to dive safely and therefore, if that's your goal you'll want to invest in an inground pool. Looking for additional resources, see below!